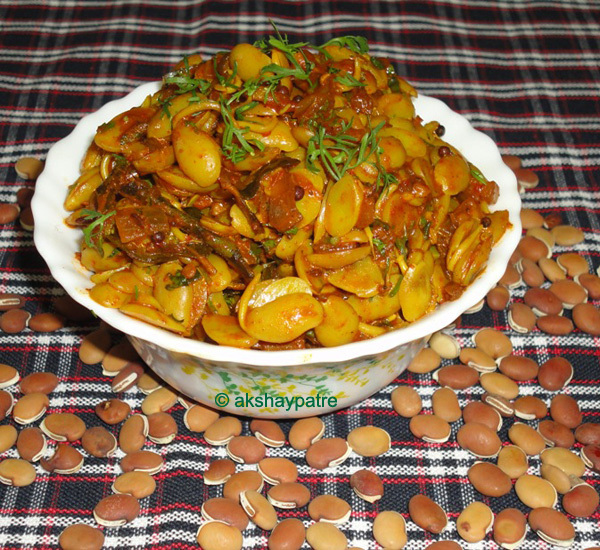 Kadve vaalachi usal recipe - Usal is a popular side dish of Maharashtra. Mostly usals are made of sprouted pulses and is flavored with kala masala. I store various pulses like green grams, brown chickpea, moth beans, kabuli chana, rajma, kadve vaal etc. in the pantry for the use during the shortage of vegetables. During rainy season, when we are unable to go to vegetable market, these pulses are handy. Kadve vaal or bitter beans are not bitter in truest sense. Instead it has an inviting nutty flavor and adorable bitterness which makes the usal very delicious. Using your culinary technique, variations can be created with sprouted pulses. Curry prepared in combination with sprouted kadve vaal and drumstick is very tasty. I'll post this recipe in due course. Now to the recipe. Hand pick the kadve vaal and rinse thoroughly. Soak for about 7- 8 hours. Drain the water and keep covered the kadve vaal in a warm place for 14 - 15 hours or till they sprouts as shown below. Remove the skin and wash the sprouted kadve vaal very gently keeping the sprouts intact. Heat oil in a pan and make a tempering with the ingredients mentioned under " for the tempering". Add the onions and crusheds garlics. Saute till the onions turn translucent. Add the chopped tomato and saute for 2 minutes. Add the chili powder and turmeric powder. Saute for a minute. Cook covered on low flame till the kadve vaal become soft. Take care the bitter beans should not turn mushy. Add the kala masala and mix. To keep the flavor intact, add the kala masala at this stage. Further cook for a minute and remove from the heat. Garnish with chopped coriander leaves and mix well. 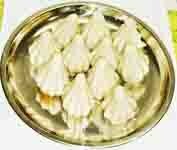 Serve the kadve valachi usal hot as a side dish. If you don't have kala masala, you can replace it with garam masala. 1. Hand pick the kadve vaal and rinse thoroughly. Soak for about 7- 8 hours. 2. Drain the water and keep covered the kadve vaal in a warm place for 14 - 15 hours or till they sprouts as shown below. 3. Remove the skin and wash the sprouted kadve vaal very gently keeping the sprouts intact. 4. Heat oil in a pan and make a tempering with the ingredients mentioned under " for the tempering". Add the onions and crusheds garlics. Saute till the onions turn translucent. Add the chopped tomato and saute for 2 minutes. 5. Add the chili powder and turmeric powder. Saute for a minute. 7. Cook covered on low flame till the kadve vaal become soft. Take care the bitter beans should not turn mushy. 8. Add the kala masala and mix. To keep the flavor intact, add the kala masala at this stage. 9. Further cook for a minute and remove from the heat. 10. Garnish with chopped coriander leaves and mix well. 11. 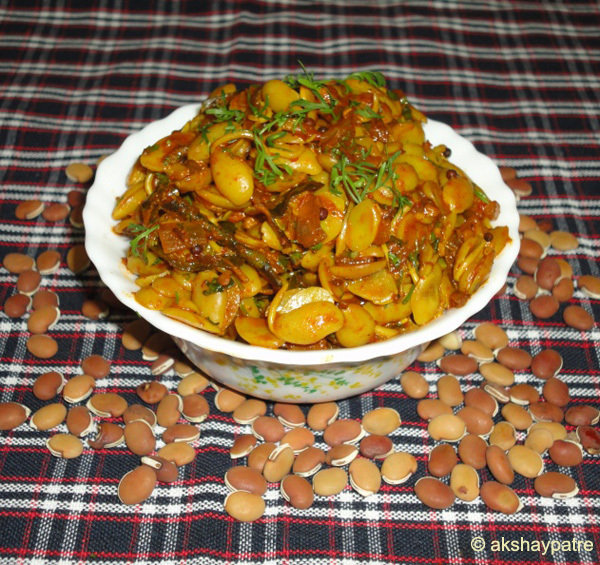 Serve the kadve valachi usal hot as a side dish.